If you click on the ingredients, it will take you to the link where I find the best deals. Including a great price on raw hazelnuts, hazelnut extract <g class="gr_ gr_128 gr-alert gr_gramm gr_inline_cards gr_run_anim Punctuation only-ins replaceWithoutSep" id="128" data-gr-id="128">and</g> hazelnut oil. In a medium bowl, cream the butter, natural sweeteners and egg (Note: if using Just Like Brown sugar, I also add 1 tsp stevia glycerite for a better flavor). Cream for a few minutes until very fluffy. In a separate bowl mix together the almond flour, coconut flour, baking powder, and salt. Slowly add in the dry ingredients to the wet and mix until smooth. Roll 2 TBS of dough into a ball in your hands (for uniform shape) onto a cookie sheet, then press down to they are about ¾ of an inch thick. Place cookies about 2 inches apart. Bake in preheated oven for 17-20 minutes or until golden around the edges. Cool completely on the baking sheet before removing and enjoy! To Make the Nutella: Heat the oven to 400 degrees. Spread the hazelnuts evenly over a cookie sheet and roast until they darken and become aromatic, about 10 minutes. Transfer the hazelnuts to a damp towel and rub to remove the skins. If you use erythritol, grind in a coffee grinder until a smooth powder. Add the cocoa, natural sweetener, vanilla, salt and oil to the food processor and continue to process until well blended, about 1 minute. The finished spread should have the consistency of creamy peanut butter; if it is too dry, process in a little extra hazelnut oil until the desired consistency is achieved. Remove to a container, cover and refrigerate until needed. Allow the spread to come to room temperature before using, as it thickens considerably when refrigerated. It will keep for at least a week. 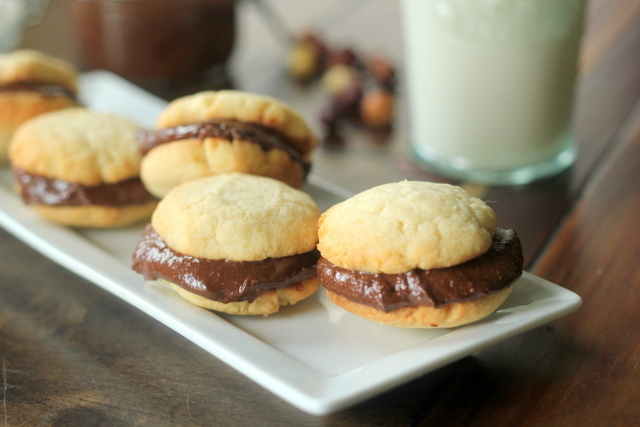 Place 1 TBS nutella in between each cookie to make a sandwich.